It is soooo cold in NC today. Cold AND windy! It didn’t get out of the 30’s today and the ind was super gusty. I know someone from the Northeast is cursing me under their breath right now, but I think you can stand what you’re used to, and us North Carolinians are not used to this type of weather. I was outside this afternoon for about an hour and a half coaching Girls on the Run. If you don’t know about Girls on the Run, I highly recommend checking out their website. It is a nonprofit program that started right here in Charlotte, but is now used all over the nation. The program takes female volunteers to “coach” an hour-long after school program where 3rd-5th grade girls lean how to have good self-esteem and also get some exercise in the process. Although we run a 5K at the conclusion of the semester, it is not a running program. We teach the girls all about the benefits of exercise and we plan games each day that involve running around a track. But, the girls move at their own pace. If all they can do is walk, then they walk. The fundamental goal is to build the girls up so that they have the self-esteem to make good choices about their health and their life in general. I really love doing it! I miss being around that age group and I would have loved to been involved in such a program at that age. It would have been so good for me. Sometimes, I wonder if the girls are listening when I and the other coach are telling them how great they are and how important it is to make healthy choices, but I think we’re doing some good, one way or another. After being outside for a bit, I just couldn’t get warm. I was chilled to the bone and took the long drive home with the heat blasting the whole way. I knew I wanted something warm and comforting for dinner. 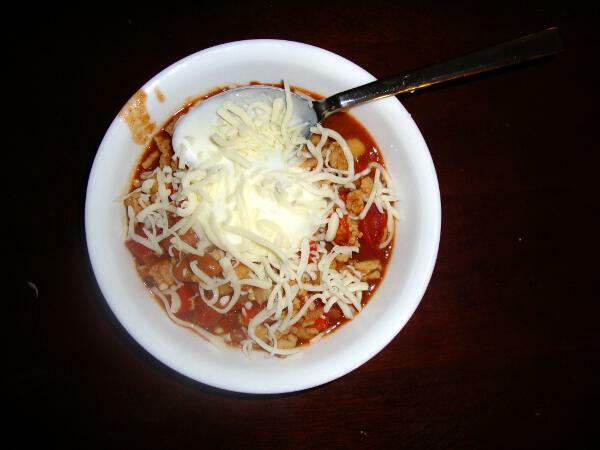 Chicken chilly chili sounded perfect to me! Saute pepper and onion in a pan. Add beans, diced tomatoes and juice, and all spices to a pot and simmer. Brown ground chicken. Once chicken is cooked through, add to bean mixture. Simmer for 20 minutes. Top with a dollop of yogurt and mozzarella cheese. This really hit the spot. Later, as I was making my lunch for tomorrow, I noticed we had some green onion in the bottom of the fridge. Had I known, this would have been an excellent addition to my little bowl of comfort.